Phil: Did I forget anything? Hey guys It’s Phil from Smilinggardener.com if you haven’t picked up my free online organic gardening course you can do that right on the homepage of smilinggardener.com. Today I’m talking about forest gardening. When we combine those two ideas of a garden and a forest we get kind of a forest-like ecosystem that really takes care of itself but can provide many of the benefits that we would want from our regular gardens. One of the main concepts in forest gardening is the use of layers, the use of different sized plants to fill up all of the vertical space and to perform various ecological functions in the garden. What we often think about is about 6 basic layers. The first one is tall trees what we call canopy trees, then there’s small trees or what we might call understory trees, then there’s shrubs that might go under that, which can be pretty tall – you know they can be 10-15ft or they can be a little bit smaller. Then there’s herbaceous plants which don’t really get woody but they’re kind of like the same size/shape as a shrub. Then there’s ground covers that hug the ground and crawl around. And then there’s root vegetables that go underground. When you’re in a temperate climate like I am you have to spread things out further, you’re probably not going to be growing tomatoes up through your trees, but in the tropics you can plant things a lot more densely and get a lot more going on in there. As we zoom out here you can start to see this is my forest garden in here. It’s just a little mini-garden that I had installed. I started to install last fall. I’m taking my time installing it I really think of it as a teaching garden for you guys and its just very small – a couple thousand square feet can easily fit on most urban properties. I’m having some fruits trees, I’m having some shrubs and herbs and all kinds of things that are going in here. So let’s get talking about some of these beneficial plants and I’ll start with the fruit trees because when you’re designing your garden you want to start with your trees. This is really my canopy these fruit trees and so you really want to go with trees that make sense for your area I have cherries, pears and apples they’re all really good in this area. This is a self-fruiting cherry that’s already producing cherries in my first year, so that’s really nice. Once we have the fruit trees designed in we can start to think about designing plants around those fruit trees to create a guild which is a group of plants that are going to support that fruit tree and provide benefits for us. Nutrient-accumulators which are plants that send their roots deep into the soil and can bring up nutrients and then when they die back those nutrients are returned to more the top of the soil where the rest of the plants can access them. So this borage here and its relative comfrey are both really nice nutrient-accumulators, yarrow is a really nice nutrient-accumulators, so these are really beneficial plants. in a new forest garden I’m going to plant as much as 25% of my plants will be nitrogen fixers. all I really have right now is this nice red-bed right in the middle. Another tree that’s very popular is a black locust a really nice nitrogen affixer. But what i’m going to do in here once this sheep mulch is broken down is I’m going to have a cover crop of clover or vetch or maybe both. Really get some nitrogen going on in this soil. Then, around the base of the tree I have various things that are going to benefit me and the tree, I have garlic which of course is very medicinal and good for me. But also, a really beneficial to have in the garden. I have daffodil bulbs which are going to help keep the grass from growing into the fruit trees, I kind of have a wall of garlic and daffodils here. And then you can’t really see them yet but I’m starting to transplant form my vegetable garden: herbs, just all over the place. Herbs are so beneficial for many reasons so I’m transplanting a dozen different kind of herbs. Many of them are very good at bringing in beneficial insects such as – what’s in bloom right now? – cilantro or coriander, really has nice flowers. Sage has nice flowers right now, the yarrow, my bee balm should be flowering soon, and then all kinds of herbs that flower throughout the year. Eventually you can have hundreds of different species of plants in your forest garden. What you want to focus on is perennial plants – that means, plants that you plant once and they just grow and they come back every year. So fruit trees, fruit shrubs, and all the other kinds of different layers try to find perennial versions of these plants. Or, you can also use self-seeding plants. So I really like to eat a lot of dill, I plant a lot of dill in the garden – it’s a very beneficial thing to have for the ecosystem, but also it self seeds so i don’t have to go planting it every year. So a forest garden is a very dynamic, complex environment there are many things we can talk about today. If you have any questions about any of this just ask them down below and I will answer. If you haven’t signed up for my free online organic gardening course you can do that down below. You can also join me on Facebook at Facebook.com/smilinggardener. On youtube at youtube.com/gardenersmiling. and i’m on pinterest now where I can share photos with you I don’t know what my domain name is there though. Gardens are where we plant organic vegetables and flowers, while forests are places where trees and understory grow without our help. When we combine these two ideas, we create forest-like ecosystems that are highly productive in addition to being beautiful and sustainable. These are different from orchards, where we usually see rows of fruit trees and maybe a cover crop between them. Those are fine too, but with forest gardening, we incorporate many more different plants, which leads to more self-sustaining ecosystems. Forest gardening involves establishing a big family of mostly perennial plants, each with its own relationships to all the others. For us, it means letting go of control in some ways, as we can’t foresee every possible interaction. But this lets the creativity of nature unfold for our benefit. This permaculture-based design concept is easiest to work with in the tropics, where there’s plenty of sunlight to share between the layers of plant life. Yet some highly successful temperate forest gardens have been created in the past few decades. In forest gardening, we imitate natural forests by filling many vertical layers of space – as well as many ecological functions – with plants that are useful to us. There are at least 6 vertical layers in a forest garden: big trees, small trees, shrubs, herbaceous plants, groundcovers, and roots. Mushrooms are often included as well. And as you get closer to the tropics, there are other layers such as vines and palms. In cooler climates and smaller spaces, we may not fill all these layers, because we have to make sure there’s enough light for plants at lower levels. Because of this, we’ll often leave out vines and the taller nut trees of the high canopy, and start our planning with fruit trees in the low canopy layer. If we planted just one fruit tree, and surrounded it with helpful companion plants, that would be a simple kind of plant “guild” – like a small nuclear family of plants. And then a forest garden is more like an extended family with lots of great-aunts and second cousins. We’ll usually select a few types of fruit trees, then support them with other plants from shrubs to herbs to groundcover, performing various functions within the system. Many of these may also produce food for us. How many different functional niches exist for us to fill is limited only by our own creativity. The more ecosystem niches we fill with plants, the less work we have to do, as they do it for us. These plants should mostly be perennial or self-seeding, as we don’t want to have to plant every year. Plants For A Future, at www.pfaf.org, is an excellent free resource providing information on many useful temperate plants’ edible and medicinal qualities, functions, and habitat preferences. It’s a valuable resource when you’re getting into forest gardening. Fruit trees are a great place to start. Often semi-dwarf varieties work best for smaller lots. I prefer them over the smaller dwarf trees because the latter can be difficult to keep healthy, due to their tiny root systems and overall lack of vigor. Nitrogen fixers are the next most common and important function – a rule of thumb is to have least 25% of your garden planted with nitrogen fixers. This can mean nitrogen fixing trees like redbud or black locust, flowering plants like lupines or sweet peas, groundcovers like clover or vetch, shrubs with edible and medicinal fruit like goumi, or even other plants that have a relationship with different nitrogen-fixing bacteria, even if they aren’t legumes. Some plants are amazing at accumulating nutrients from the soil and then sharing them when they drop their leaves or when roots die back. Comfrey, nettles, and yarrow are superstars in this category. For insectary plants, it’s great for both the insects and you if you choose plants with a variety of sizes and shapes of flowers, that bloom at different times throughout the season. You can’t predict exactly how the whole forest garden family will get along, but you’ll learn as you go, and take pleasure in seeing a mature ecosystem develop that meets your needs while sustaining itself. Any questions or comments about forest gardening? Feel free to let me know below. I like your info-packed, spritely-paced style in the video and article! I get lots of good info in a small space :)I’m very interested in the concept of perennial gardening that you mentioned. My understanding was that crop rotation was critical to maintaining soil fertility and suppressing the life cycle of unwanted pests. Does the forest garden provide the same benefits as rotational gardening by using the deeper root systems of these large perennials to bring up fresh nutrients each year to the surface?I love the idea of deciduous trees because they will naturally mulch your garden each fall! Thanks David. 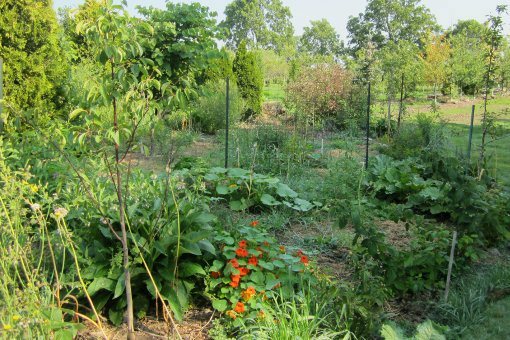 Crop rotation actually isn’t necessary in a garden that’s optimally healthy. Farmers around the world have grown the same crops in the same fields for hundreds of years. That being said, it’s still considered to be a good practice for the most part, and since we can do it with annuals, we mostly do. Of course a forest isn’t rotated annually and overall it remains very healthy. Speaking of crop rotation, a friend just told me that you can replant tomatoes in the same spot year after year if you also plant broccoli there. Haven’t tried it, but I’m about to. Has anyone in this forum had success with trying this? Hey Phil, are you going to be pruning your fruit trees much, or letting them grow to their natural form? Are these semi-dwarfs in the vid? What was your spacing? How many trees were you able to cram into that space? What zone are you in there? Many, many questions. Thanks!! Some of them I prune quite a lot, while some of them I let grow naturally. They are mostly semi-dwarfs. Spacing depends on the tree and the kind of root stock – I think in my case mine was mostly 15 feet for the trees I’ll be pruning and 25 feet for those I won’t. I can fit 4-5 semi-dwarf trees per 1000 square feet. I’m in usda zone 5. Sure Joe, I’ll email you now. Our family is gardening to produce the most food naturally grown. Last season here in ND we grew 500 lbs, tomatoes and Squash weighed the most. We crossed Pumpkin with Zucchini and got what we call Oval Squash.it grows larger than a football and keeps for 8 months in the house. We ate the last one today. We are planting out a 3000 square foot Food Forest plot this season with 12 x 60′ black 6 mil covered Swales on contour. It is going over sloping lawn so we put down newspaper under cardboard and then the 18 inch 6 mil covered rows at 5′ spacing. We plant the major plants in the Swales by cutting an X slit and inserting them into the composted potting soil inside the row. The 3′ in between the rows are open (over potting soil over paper and cardboard) the rest of the food forest lower growing plants. We use drip tape inside the row berms with 12 volt timers and moisture sensors, to keep from over watering with surface well water The contour rows catch the water for the plants in between the rows. We are hoping that this more intense larger planting area designed from what we have learned so far together with the information you have provided on this site will bring a 10 fold increase in our Naturally Grown Urban City Food Farm production. Thanks Again for the information ! PS: We have seed for the Oval bumper crop plants send a stamped SASE envelope to Our Farm PO Box 495 St John ND 58369 and we will drop you some seeds to try. Thanks so much for sharing William! Hi. Do you still have some seeds for the Oval Squash? I would like to try them. Thanks. I love my garden, but am very frustrated by RABBITS! They are eating everything, including my roses. Any suggestions would be appreciated (I have tried all commercial products with NO success.) Thanks . Helpful video. Thank you. We just put 2 inches of beautiful leaf mulch on bare clay soil in our backyard. When can we start planting? Short answer: right away. Long answer: It depends on what you’re planting. Some things are planted well before frost and some after. The best is to search online for a planting calendar for your area.